Marrakech is home to a labyrinth of bustling souks (workshops and markets) offering the city's most fascinating wares. Whether shopping or exploring, they are a must for any visitor. At the northern end of the souks, best accessed from the Ben Youssef Mosque, there are blacksmiths making wrought-iron goods and the distinct odour of leather workshops wafts down the alleys. The stalls emerge further south and are met by the Rahba Kedima, a market famous for its bizarre offerings of animals and eccentric potions for spells. The market is colourful and crowded with plenty of fodder for keen photographers. Moreover, there are real bargains to be found if you haggle hard: the first price given will invariably be more than double what would be a fair price as the merchants expect customers to bargain. 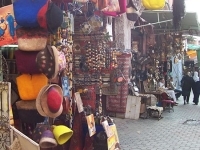 The souks are a wonderful experience and many foreigners visit repeatedly during their stay, but although guides are absolutely not necessary in the market, it is advisable to stay vigilant and keep an eye out for pickpockets. Transport: The souks are best explored on foot.